One of the final steps in the bearing manufacturing process is the assembly of the individual bearing components: the outer ring, inner ring, balls and retainer (or ball separator). When the bearings are assembled, it is necessary to have a controlled amount of internal clearance, or looseness between the rings and balls. This is referred to as radial play in most bearing catalogs. In certain applications, this internal clearance must be removed for a pair of bearings to operate properly. The application of an axial load across a pair of bearings – for the purpose of removing free internal clearances – is called preload. 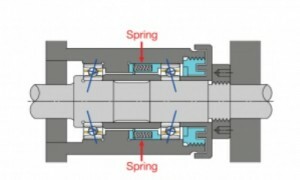 Preload is critical in most high-precision and high-speed applications, particularly where rotational and positional accuracy is required. If, under operating conditions, a bearing has radial play this means that one bearing race can be moved radially and axially relative to the other. With rotation, this looseness translates into wobble or non-repetitive runout. This motion is unacceptable in applications such as machine tool spindles, electric motors, optical encoders, flow meters, and high-speed hand tools. The application of axial preload forces the balls into contact with raceways, establishing a contact angle which causes the ball set to rotate in a uniform circumferential plane.